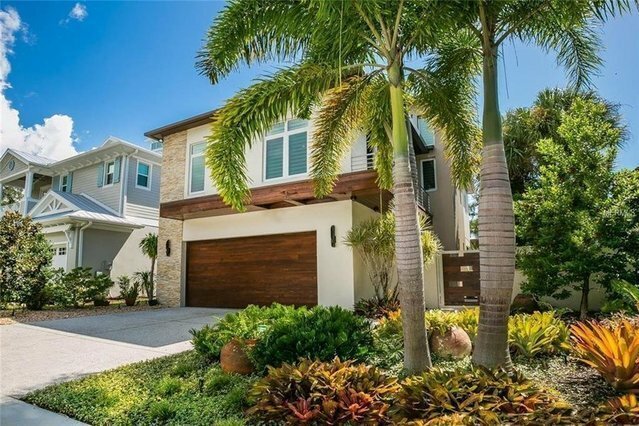 Gorgeous 2014 West of Trail home, custom built by My Green Builders as a Certified Florida Green Home, with interior design by Kurt Lucas of the renowned interior design firm of JKL Design. This one-of-a-kind home features a cutting edge fresh new floor plan and incredible high-end finishes. Enter through the beautiful gate and garden courtyard to your spectacular home which features a wide open floor plan with soaring ceilings, state-of-the-art kitchen with Bosch stainless appliances and reverse osmosis water system, adjoining dining and living areas, plus four bedrooms, three full baths and powder room. Master suites on both the first and second floor, featuring lavish baths and custom walk-in closets. Gorgeous bonus room/gallery space upstairs. Rich details and high end finishes throughout including cypress wood, stone veneer exterior, metal roof, Porcelanosa floors, hickory wood floors, walnut built-ins, surround sound system, 10' movie screen in master, high efficiency ACs, remote controlled shades, LED and designer lighting, extra thick Stileline Shaker interior doors, Kohler and Hans Grohe fixtures, and more. Incredible outdoor space with beautiful pool and deck plus orchid pergola and cypress fencing. Southside school district. Charming and historic neighborhood, close to the great restaurants and cultural amenities of Southside Village and Downtown Sarasota and #1 Siesta Key Beach.